Cord type torque wrench with limit switch. Connects CNA-4mk2, count checker which tracks tightened bolts. Torque verification system can be set up to alert worker to missed bolts. 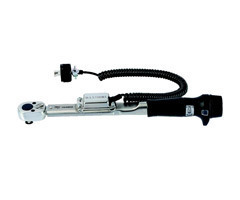 Durable curled cable is used as LS torque wrench. Wireless Pokayoke transmitter FH256MC can be loaded on the torque wrenches listed below. Refer to base model series for specs. K-44 female connector is optional. Limit switches can be installed on other click type torque wrenches. Female connector for LS cable is not supplied as standard accessory.